Yep! You heard me right! Not only is it delicious, it’s easy too, and can be made either in the oven or microwave. When you are looking for a dessert for your special occasions that won’t take you far off plan or cause a spike in your blood sugar, this recipe from tasteaholics.com is it. Every so often when you are tempted to eat something you really know isn’t in your best interest, try replacing that treat with one that is healthy and low-glycemic – not to mention great tasting. The key is not making dessert of any kind an everyday event. This recipe is better left for the maintenance plan. Preheat your oven (if using) to 350°F. Blend Swerve and cocoa powder together to remove clumps. In another bowl, beat the egg with a fork or mini-whisk until a little fluffy. Add in the heavy cream and vanilla to the cocoa mixture. Then add salt and baking powder. Mix well. If microwaving your cake, pour the batter into a 12-14 oz coffee mug. All microwaves are different, so cook for about 1 minute and check to see if the cake is mostly solid but still jiggly on top. If too wet, microwave in 10 second intervals until done. Be careful not to overcook or the lava won’t flow! Allow to sit for 30 seconds, then turn mug upside down onto a plate, giving a gentle pat to release the cake. You can simply eat it out of the mug, as well. 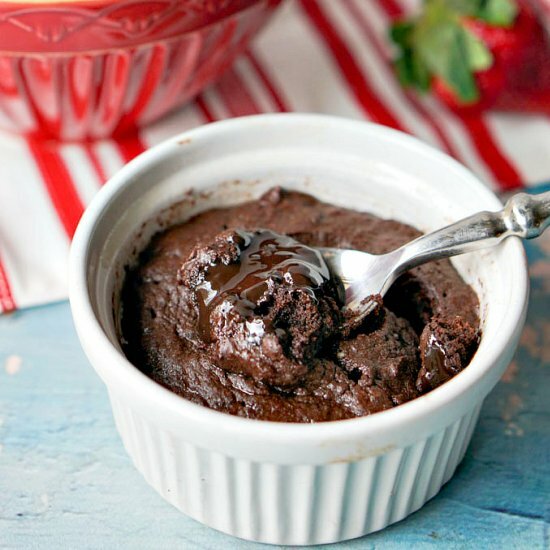 If baking in the oven, lightly grease a ramekin, pour batter into ramekin and baking 10-15 minutes. Check at 10 minutes to make sure cake is not wet. It should be mostly baked, but a little jiggly. Do not overcook!